Fire is a calamity that strikes without any warning and causes an unimaginable havoc. According to a survey conducted, 80% of the most damaging fires occur during night times, weekends or holidays when no one is around. Hence an automatic operation is the only solution for round-the-clock protection against any kind of fire. 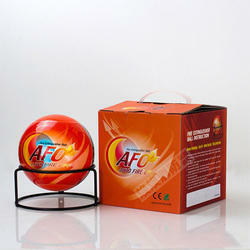 We are engaged in presenting an extensive range of Automatic Fire Extinguisher to our clients. In addition to this, customers can avail these Extinguishers at competitive prices. Capacity Option: 5 Kg. & 10 Kg. Safex presents modular type ABC clean agent gas and ABC Dry Chemical Powder along with a range of gaseous automatic fire extinguishers. - Area Coverage: 3mtrs. approx. DESIGNED FOR ROUND THE CLOCK, ROUND THE YEAR, TROUBLE FREE , AUTOMATIC OPERATION WITH 100% SAFETY. The most damaging fires usually start in unoccupied areas or at times when no-one in about such as night time, weekends and holidays periods. We are involved in delivering a wide series of Automatic Modular Fire Extinguisher. Our presented range is available in diverse specifications that meet on client’s demand. We offer clients well known and extensively demanded ‘Bonpet’ automatic fire extinguisher. Featuring automatic functioning, these find extensive usage in places like manufacturing plants. We also offer clients related installation services.